I have mentioned in passing on my model making thread that I'm a member of a group that is building, more or less from scratch, a full size, fully working replica of a express passenger locomotive of the late 1890s. I've been a member for the last six months or so; provided I keep up the subscription I'm guaranteed a seat on the first public train it hauls. We had our AGM and Supporter's Day today at the project base, Ruddington Transport Museum (just south of Nottingham). So here are a few photographs. This is the cylinder block. One of the curious facts is that the cylinder block from a 1950s industrial tank engine is an almost perfect match for the cylinder block in a late Victorian express engine. This then is a 1950s casting that is practically brand new; cast as a spare part for a batch of locomotives, but then never used. It spent a couple of decades under a hedge! Because the cylinders were coated in rust retardent there's no real restoration work to do there, but the same cannot be said of the valve casing between them. The block is made of two castings bolted together; to clear out the valve casings the castings need to be unbolted. Outside in the yard more of the motion parts had been set out for inspection. Much of it is either built, in manufacture or on order. Off-site (currently being machined) are the locomotive frames. Once they have been fettled and erected the locomotive can properly be said to exist. One of the few deviations from the original design is to alter the front end design of the frames so that in the event of a rough shunt they don't buckle. A couple of frame stretchers were on display though, as were the sandboxes which will eventually by bolted directly to the frames. It might not look all that impressive at the moment; but elsewhere on site is the complete tender chassis. The finished loco will weigh around 40 tonnes, and about 8 tonnes of material has already been worked up or is in manufacture. This is a long-term project of course; it has been gathering pace for the last five years and it currently looks as though it will be around 2022- 2024 before completion. Elsewhere on the site are around ten carriages of the Great Central Railway in various stages of restoration. Newly-completed is a six-wheel carriage of the 1880s. In a siding are these two unique survivors. And nestling behind it, almost obscured by a prototype HST power car, is an arc-roof suburban carriage of around the same vintage- the real thing of the carriages I build out of Ratio kits. We're always on the lookout to gain new members, so if anybody wants to join the group they're more than welcome. As is the nature of these things of couse it can take years for the thing to be finished; so I guess this thread will go on for "quite some time" and only be updated on an occasional basis as work gets done. This looks like an interesting project, James, and a long term one at that. On a similar type of project but different piece of engineering, there is a group at Werribee (town near Melbourne, Victoria) who are restoring/rebuilding a WWII Liberator B24 - I get the newsletters from a chap in NZ who keeps me up to date with progress. It's of interest to us because our respective dads flew the planes, in India. So, apart from being a really interesting project in it's own right, I can see the attraction for the train! I must take more time to find these parts than it takes to refurbish and rebuild them? Keep us posted- it sounds like a worthy project! 1) The last Midland & Great Northern Joint Railway locomotive was scrapped way back in the mid-1930s.... yet the boiler off of it survives. 2) Similarly, only one complete Ivatt Large Atlantic survives in preservation. The boiler off of a long-scrapped classmate was found about twenty years ago though and is now the basis of another new-build project. 3) The GCR 567 project is using an original 1890s Great Central tender. The tank is admittedly shot but the chassis and wheels are still serviceable. The tender had survived long after the rest of the loco was scrapped because it was being used to carry boiler sludge. 4) A project to build a replica 1850s express loco found not one but three surviving original tender frames. The locos had been scrapped in the 1880s but the tenders were re-purposed as snow ploughs. It happens more often than might be thought. It really wouldn't surprise me if an 'extinct' loco class were in fact found out to have a survivor- albeit in hundreds of pieces, from various locos, up and down the country. Well that's the beauty of standardised parts, there's plenty of bits out there that still remain, e.g. the A1 trust (the people behind Tornado) are actually using spares and/or copies of parts they had made for Tornado in their new P2 build. And there's plenty of examples of re-purposing outside the world of locomotives. Fer' instance, the only reason the SS Great Britain survives in dry dock is because some bright spark had the bright idea to have it beached to use as a coal bunker instead of melting down it all down for scrap. - The frame stretchers (there are two of these) have been manufactured. If you think of the frames as being like a ladder, you have the sideplates (which run the length of the loco) and then you have the frame stretchers, which go crosswise between them like the rungs on a ladder. I say these are smaller parts but they are about 4' long by about 1' - 1' 6'' deep! Quite chunky pieces of steel plate. - New fittings for the various machines required to manufacture the components have been ordered, which will allow more work to be done on-site and less work will need to be sent to outside contractors. 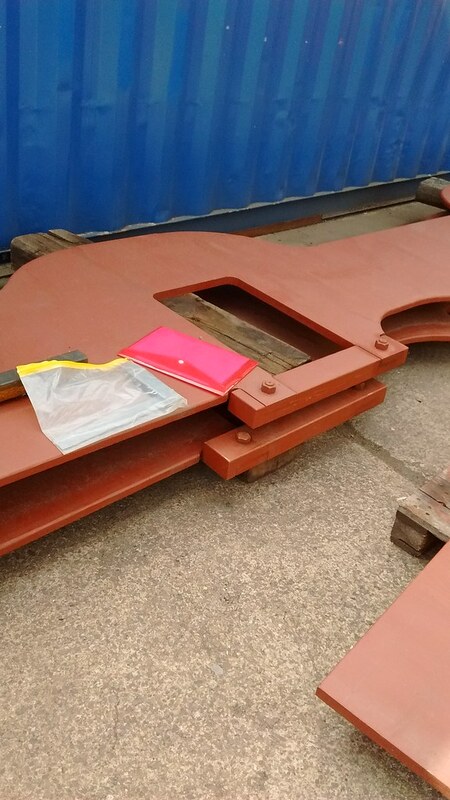 For instance, the drag boxes (huge lumps of metal into which the locomotive couplings are fitted) will be able to be manufactured at Ruddington rather than needing to be made elsewhere. It will now also be possible to remachine the corroded valve faces in the cylinder block in-house. The plan for 2017 (and I say 'plan' because this is a very much a volunteer project and things are obviously apt to change) is to erect the frames and the motion, and then start work on designing and manufacturing the leading bogie and a new tender tank. There's also going to be more regular updates on the website (www.gcr567loco.co.uk), so if anybody is interested in joining the society then please do! I appreciate it is a little disconcerting seeing a website for an interesting project and then finding it hasn't been updated in a few years, but that should hopefully be changing soon. There's also a facebook group (https://www.facebook.com/groups/GCR567Loco/) which does update more frequently. We have a new website up and running! There's a lot more background information to the project, a little bit about an affiliated group that is restoring surviving Great Central Railway carriages- with a piece describing their newly-completed 6-wheel carriage- and the latest society newsletter and article for 'Mainline' (the society magazine for Friends of the Great Central Mainline). Speaking of which, I believe both the next quarterly newsletter and the next issue of 'Mainline' are due soon-ish- so I should be able to provide another update on progress in the next few weeks. Fingers crossed. When I am not at work, I must like the Facebook page for this project. On my Bucket List is a trip across the pond to to England. I am always impressed with the work that goes into the preservation of steam locomotives, and I do believe that England has some of the best efforts. The only "new-build" project I am aware of here in the States is that of the Pennsylvania Railroad T1 No. 5550; but, I can't imagine the whole locomotive will actually materialize, it seems much too grand an adventure when mainline steam excursions are waning due to costs and liability. I will be watching with great interest, sir. I think that's an important point you bring up about mainline excursions being wound up. We have a similar problem in the UK; in fact with several, facets in that firstly the company that owns the track is fond of arbitrarily declaring locomotives 'out of gauge' on various routes (ie stating that they'll foul bridges and platforms), which makes things more difficult (last Christmas there was supposed to be a steam special from Birmingham to Lincoln which was cancelled at the last minute after it was decided the engine wouldn't get through Nottingham station without taking the platform copings with it. Fair enough, except the same engine had taken a train on the same route with no problems at all a few months previously. Maybe permanent way pixies come along in the night and move the rails around). The second part of the problem is that there are only two rail companies passed to supply drivers for mainline operations (there are plenty of volunteer steam drivers around the country of course, but there's a bit of a difference in legal red tape necessary to drive a steam engine at 20mph on a private length of track and taking that same engine at 60mph+ on the national network). So there's a shortage of suitably qualified and insured loco crew. This second part is compounded by the third part of the problem; one of those two companies has had an 'interesting' recent history that nearly resulted in it being denied access to the national network- not only did they run a steam train through a red light and end up stopped across a junction with a 125mph+ express mainline, to go through the red light in the first place one of their staff had tampered with safety equipment. And if those three issues weren't enough, there's an ongoing programme of signalling and electrification works, to increase capacity on the network. Retrofitting steam locos with the new signalling gear can and has been done, but it's expensive and most of our preserved locos are owned by private individuals or syndicates and clearly some of those are going to see this latest hurdle as too much hard work to be worthwhile. I'm of the opinion that mainline steam in the UK most likely only has a few decades at most left. Luckily (and I guess we're spoilt here) we do have a vibrant preservation scene- if I draw a 35-mile radius from my house there are about eight or nine steam railways I can visit (Chasewater, Severn Valley, Telford Steam Railway, Foxfield, Churnet Valley, Peak Rail, Great Central and Great Central (Nottingham) ). I find it disconcertingly easy to forget that at times. The Spring 2017 copy of Mainline landed on my doormat yesterday and there is a small update on works to #567 and a writeup of the October AGM (which I attended and my impressions of such form the opening post in this thread). As of last October, we had managed to either buy or reserve most of motion and valvegear. A lot of these components actually come from a stock of spares for the Robert Stephenson and Hawthorns class 56 industrial tank engine design, of which there are two preserved at Ruddington. It may sound odd that mechanically speaking a 1950s industrial loco is identical to an 1890s express engine, but in examining the drawings of the two types it would appear that in designing the GCR type 2 4-4-0, Kitsons (builders of the prototype of the class, #560, in 1887) used a number of their standard components for the motion and valvegear. When the Great Central took ownership of #560, the first thing they did was to tear it to pieces, so as to allow the production of a set of drawings of their own at Gorton to allow further examples of the class to be built in-house. Hence it was 1891 before a further six examples of the design (GCR #561 though #567) appeared. Further examples were built between 1891 and 1895, in several batches split between the GC works at Gorton and Kitsons. Kitsons went bankrupt in the middle 1930s and in 1938 the name, goodwill and drawings of the company were bought by Robert Stephenson and Hawthorn. There is then evidence that the standard Kitson motion and valvegear designs were applied to RSH locomotives in the 1940s and 1950s... so there we have it. Robert Stephenson and Hawthorn industrial locos of the 1950s used castings and components that hadn't changed in over 60 years. As the AGM writeup notes, all of this means that there is a significant amount of the locomotive ready and waiting to be erected once the frames are returned to Ruddington. 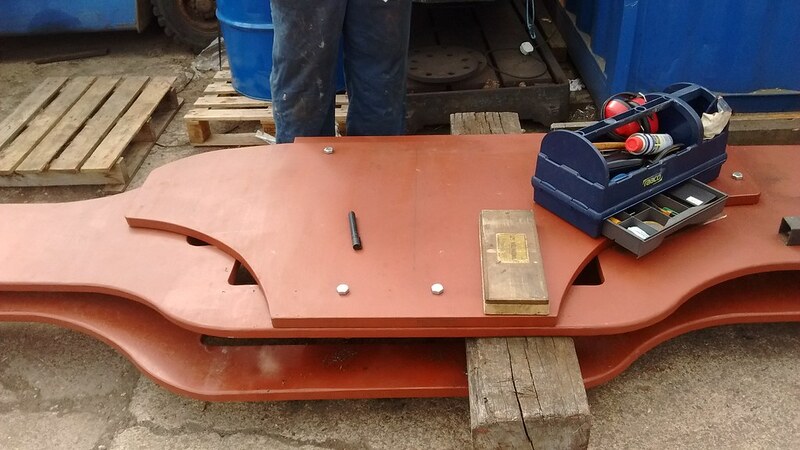 Work is progressing on the manufacture of the motion- the parts that aren't provided for by industrial loco spares that is- the metal bars that will ultimately form the slidebars are stored whilst we're sourcing a contractor to mill and grind them to size. There's an awful lot of the engine already built- and even more still to build!- and once the frames have been returned to site we'll be in a position to erect quite a sizeable lump of the engine. The latest quarterly newsletter has arrived in my inbox this afternoon. A few weeks ago the Summer issue of Mainline also arrived, the update in the magazine however was very much a case of 'work is progressing' and not much more. The newsletter, on the other hand, discusses the ongoing machining of the frames. The frames are 40' long, inch-and-a-half thick steel. They can't be machined at Ruddington as this is rather involved specialist work; hence they've been contracted out and the only news we've had about them previously has been that 'they're being machined'. What does this involve and why is it necessary? Obviously you can't just go to a steelyard and say 'I want a pair of MSLR Class 2 frames' and have the steelyard reply 'certainly Sir, we've got a pair sitting in the stores round back and the lads will drop them off this afternoon'. It would be nice (and much easier!) if we could, but we can't. What you can do though is go to the same steelyard, order two off sheets of steel 40' long by 4' wide by 1.5'' thick, and the steelyard will oblige you. They can even rough-cut the steel for you. But there is a difference between a piece of steel roughly cut into the shape of a locomotive side frame, and an actual locomotive side frame. So this is what the machining is about- taking the two rough blanks as they arrived from the steelyard and turning them into the finished article. There are several elements to this job; firstly (this might sound obvious!) you have to make sure that the two blanks are identical.... secondly all the rivet and bolt holes, the apertures for the axles and hornblocks, the recess the cylinder block sits in..... all of those have to be carefully measured, measured again, compared to drawings and measured again, rough cut, measured and compared, cut again and then the edges finished, and then thirdly the sheet steel has to be bent to shape. This last operation, bear in mind that we've slightly tweaked the frame design to improve the strength of it at the front end, which involves setting the cylinder block actually into the frames and then requires the use of doubling plates and bends around the cylinder block. The latest news therefore is that the machining of the frames is complete; they've been cut to size and shape, all of the necessary holes have been drilled cut or punched through them and they're now moving on to the bending part of the operation. To make sure they're identical, they were first welded together, and then machined. Now they will be separated and then bent, at which point we'll move from having two identical frames to a handed pair. Moving away from the frames and looking at the motion, the slidebars have been sent away for final grinding and finishing. Back in October at the Member's Day the material for these had just been delivered; you may recall a photograph I posted at the time of eight long bars of metal wrapped up in blue plastic. We're now starting to look at the design of the big end straps and the crosshead slide blocks. The crosshead slide blocks are joint, if you like, between the piston rod and the connecting rods. They (as their name suggests) slide back and forth in the slidebars and are the component in which the back-forth motion supplied by the cylinders becomes more a rotational movement. The connection between piston rod and crosshead slide block is fixed, whilst that between the slide block and the connecting rod is a pivot. At the other end of the connecting rod is the crank axle. For an inside-cylindered engine, if you imagine trying to thread the connecting rod onto the axle, to quite quickle see the difficulties you run into.... you have to try and turn it 90 degrees one way, then 90 degrees another, and then even if you do manage that the frames get in the way.... so the way to get around this is to cut the connecting rod off short of the axle, and then run a strap around from the connecting rod, around the axle, and then back onto the connecting rod. We call it a 'strap' but it's a bit more than just a piece of leather!- it's a large, heavy lump of steel with whitemetal bearing faces where it meets the crank axle. It is exactly the same principle as is used in a car engine. Except in this case of course it's that bit bigger. It's a little early for an update yet; newsletters and updates are generally put out at around 3-month intervals (meaning I expect to be able to post another bulletin sometime in the middle of September). However; a few days ago I found out about this (although it's a faceache page it is set up so that non-faceache people can see it). So; an opportunity to see a restored Great Central carriage, an opportunity to see the other seven (I think there's seven) ex-Great Central carriages on the same site, a run along 10 miles of preserved track with a chance to see the extension works at the other end (by the time mid-September rolls around the new bridge over the Midland line should be largely in place)- oh and the GCR567 group will also be there. Happily however, if anybody does want to view a fully restored Great Central carriage dating from the 1880s, you now can. Carriage 946, having recently completed a 16-year restoration, has been moved from the workshops at Ruddington and is now on display at the Montsorrel Heritage Centre, Leicestershire. The date for the Supporters Day and AGM of the 567 Group has also been announced. 10.30AM on Sunday November 11- I'm rather looking forward to going and seeing the progress since last year's AGM. I should have waited a day! Talking about the motion and valvegear itself, more components are being made, restored or sourced. We are now looking at contractors for work on the connecting rods and the manufacture of the crossheads. With the imminent return of the frames it can perhaps be expected that progress will step up a gear; hopefully it won't be too long before we have the basis of a locomotive we can have a walk around. I mentioned yesterday about the AGM and Supporters Day in November. Only members of the 567 Group will be allowed to attend the AGM- however, on past experience people can turn up just for the workshop tour and talk, sign up as a member of the Group in the morning and be allowed to attend the AGM in the afternoon. Another immensely enjoyable late Autumn/ early Winter day spent just south of Nottingham today; the 2017 Supporter's Day and Annual General Meeting of the 567 Group. First, a quick look around the Ruddington site, as things are always changing there. There is always that one guy who takes up half the car park.... this is an LMS class 8F heavy freight locomotive currently resident on the Great Central Railway (North). Last year it kept breaking its springs, this year it has tired of that habit and developed firebox problems instead. So she is currently out of service and steam trains are handled by a British Railways standard class 2 brought in from the Great Central Railway (Loughborough). Elsewhere on the site, there is a new workshop being erected (intended for carriages) and Ruddington Fields station has gained a temporary booking office (last year station facilities ran to a platform and a telephone kiosk) whilst work proceeds on a second platform. The platform is built and I did notice today that track now extends about halfway down its length. The ultimate plan for the station I believe is to build something on the lines of a miniature grand mainline terminus. Right; onto the main event. There was a good turnout as not only was it the Supporter's Day but also the Derby Locomotive Society had been invited to attend as an outing for their members. Things were therefore a little different to last years proceedings, for the morning at least, as in addition to being shown developments on our locomotive we were given a general tour of the workshops for an idea of just how much work goes into keeping a preserved railway going. Right up to a few weeks ago there was a hope that the locomotive frames would be completed and delivered back to Ruddington in time for the AGM but sadly this has not been the case. It is a case trying to programme our project into the wider workload of the subcontractors; sometimes the necessary machinery might be between jobs but the operator best suited to the work is too busy (or vice versa). The Group Committee have said however that when the frames are completed and delivered, there will be another Supporter's Day organised so everybody can go and have a look at them. This aside, there was still a sizeable number of components on display and it was nice to see how they have progessed over the year. The quarterly newsletter of course describes what work has taken place but it is difficult to imagine exactly what is meant and so being able to see a finished part and think back that this time last year it was merely a newly-delivered lump of rare material is very satisfying. Shall I show a few photographs? Lets start with a reminder of where we were last year. Wrapped up in blue plastic is some newly-delivered steel bar to be worked up into slidebars. Slidebars are steel rails extending back from the cylinders which act as guides for the pistons. Above those bars are the crossheads. These sit on the end of the pistons and the connecting rod sits inside of them. The connecting rod pivots in the crosshead and it is in this assemblage where the back-forth motion of the piston into and out of the cylinder turns into more a rotational movement turning the axles. Outside of the crossheads are the slidebar slippers. There are eight slidebars- each cylinder has four- two upper and two lower to each cylinder. The slippers, as their name suggests, sit between the upper and lower slidebars and shunt back and forth along their length- they guide the movement of the pistons. Finally there are eight brass oil pots. These oil pots sit two each to each upper slidebar. They provide lubrication, as might be expected. Then around the slidebars we have various cylinderblock-related castings and at the back some parts of the valves. So, that's how things stood in October 2016. The slidebars are now complete. They have been machined and ground 'true' (that is, straight and square) to tolerances of 4 thousandths of an inch. Each face has been separately machined, as we needed two 'true' faces to each, but the onyl way to do this to machine all four faces. They've also been treated with an anti-corrosion/ preservation material to prevent surface rusting/ pitting. They are the eight oily-looking bars wrapped in cellophane in this photograph. Above the slidebars we have some new components, I'm not sure what the technical term is but basically they are the fixings between the slidebars and the motion frame stretcher (of which more later). And then finally above those we have the oil pots from last year, mounted for the present on a 'fake' slidebar for exhibition purposes. Another part of the motion; this is the pattern for the spindle valve cover. What does this do? If you think of steam going into the cylinder to push the piston out and turn the wheels a quarter of a turn, you need something to shut off that steam supply to allow the piston to come back into the cylinder and permit the wheels to complete a revolution. Otherwise you're compressing the piston and connecting rod between the wheel, which wants to rotate, and a cylinder full of steam, which will compress a ways but only so far. Something has to give and that could be the cylinder head blowing off, the cylinder side exploding out, or the motion getting twisted and warped out of shape. So the way we avoid this is to set the cylinders up so that as steam is rushing in and pushing the cylinder out, the resulting turn of the wheel is pushing something into the steampipe to shut off the supply of steam and open a release valve to let the steam in the cylinder out. Same as with the pistons and connecting rods though, unless you're guiding the direction they're moving in, this rod could well get warped and twisted. So it sits in the spindle valve cover, which guides its movements. Last year this component was at an early stage of construction. It is now finished and ready to be sent to the foundry for casting. There are comparatively few castings in this locomotive; much of it can be built out of various steel plates, sheets and tubes. This is the motion stretcher. It was on display last year- it can be seen at the foot of the photograph of the motion and valvegear in 2016- but it was then incomplete and unpainted. It is now finished and painted and when the sideframes return it can be fitted. It provides the 'back end' for the slidebars. There's another stretcher too!- this one sits at roughly the mid-point of the sideframes. This one wasn't shown last year but again has been manufactured over the course of 2016-17 and is also now complete. This photo quite neatly illustrates the scale of some of these parts. It has been built in-house at Ruddington and, stood on end here, is about 4 feet high and eighteen inches wide. Quite a chunky piece of metal. Well that concluded the show and tell part of the day and we moved on to a general tour of the workshops. 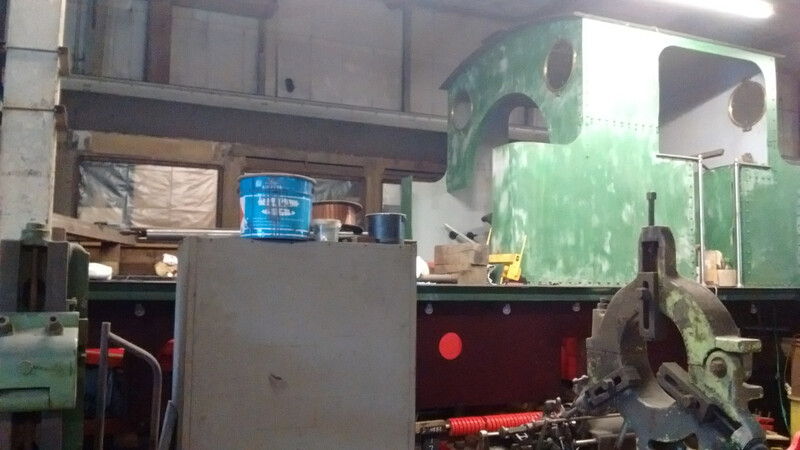 What we see here then is one of three industrial tank engines undergoing restoration on the middle road of the shed. Now the shed has three tracks, or in technical parlance 'roads' running into it. The first road has an inspection pit- we couldn't see this today because there was a big diesel engine shunted over it. The middle road has these three industrial engines on it. The third road last year was taken up by a pair of Great Central carriages dating back to the turn of the 20th century. This year one of those carriages was still there, but the other has been completed and is now on public display at Montsorrel in Leicestershire. More on these carriages shortly. The point was made by our Chairman that if everything currently being worked upon was complete and available on site, #567 could in short order resemble this state of completion- frames up, motion and valvegear erected, and running plate and cabsheets being set up. Another eighteen months to two years and we could well be at that point- if not further still! The rate of progress is very much dependant on donations and volunteer effort, if money isn't coming in or people don't do the work then progress understandably slows. At current rates of progress we're expecting a completion date between 2022 and 2024. I said a little while ago I would talk more about the original Great Central carriages on site. You may recall back in September there was a special open day organised by the Great Central Railway Rolling Stock Trust to show and tell their collection which I hoping to go to but ultimately had to sit out. They have nine carriages in their care at Ruddington- sorry, eight now excluding #946 at Montsorrel- and their next project is going to be the first of their four Barnum carriages. The Barnum carriages are so called becuase of their distinctly North American appearance- they represent a step change of sorts in British carriage design in being amongst the earliest examples of American-style open saloon carriages in the UK. They are built of teak on steel underframes and date from 1910. When all four are completed and paired up with Butler Henderson or #567.... well that will be a very special sight indeed! So that was our 2017 AGM and Supporter's Day. Quite a lengthy post but I hope you find it informative and entertaining and I'm sure you'll agree quite a lot of progress achieved. Another quarterly newsletter arrived today. Several big bits of news! 1. The slidebars (which at the 2016 AGM were newly delivered billets of material) are now finished, except for one which was unfortunately damaged by the contractor. The contractor of course is replacing the damaged component and a replacement bar has been ordered. 2. The next element of the motion and valvegear is being looked at- these are the connecting rods, the crossheads and the big ends. The crossheads sit on the end of the pistons and slide back and forth along the slidebars. The connecting rods are secured to the crossheads via a pin and pivot arrangement, and the big ends are a C-shaped element that bolt onto the end of the connecting rods and trap the crank axle. Thus these three elements are responsible for tranferring the power from the cylinders to the driving axle. Of these components we already possess the connecting rods. These are second hand from an Austerity tank engine, much the same as any other new-old component though they will need a degree of cleaning up and repairing before they can be used. Specifically with the connecting rods there is a large amount of surface pitting to the metal that will need to be addressed. 3. Machining of the frames is complete. The next stage of frame manufacture is to introduce some bends into them around the area of the cylinder block- this will be done by a separate contractor and once that contractor has the frames it is anticipated that bending them should take about a fortnight. Once that is done the frames will be moved again to a third factory for construction and fitting of the hornstays. 4. At the AGM the last of the horn guides were sponsored, construction of those four components is now funded and their manufacture can take place. What are these? They are an element of the suspension of the locomotive. If the axles were merely pushed through apertures in the frames, the inevitable discrepancies in the level of the rails would lead to stresses being set up in the frames, the locomotive rocking around, and potentially even a derailment. Imagine trying to balance a four-legged stool on uneven ground and how deifficult that can be. The way we avoid this is to give the axles a degree of springing, and then allow vertical movement in the axles by setting them in lumps of metal plate called 'hornblocks' which can slide up and down in the frames in 'hornguides'. Around the hornblocks of course the frames require a lot of local strengthening to restrain the movement of the axles purely to a vertical element. 5. There is a new list of components for sponsership in preparation. This list will consist of the new-old stock motion and valvegear we have reserved for the project but not yet purchased. In summary; a lot of progress in this last quarter; indeed over the year. Fingers crossed this time next year I will be able to show you all a new Victorian express locomotive at an early stage of actual erection, as opposed to manufacturing and collecting individual components. Want to get involved? There are still around 20 seats available on the first train, which is reserved solely for the first 200 members of the 567 group. Join us here. Late March and so the first quarterly newsletter of the year makes a welcome appearance. The big news is that the frames have now been fully machined and bent, and are now back with a subcontractor for casting and fitting of the hornstays. With all four of the horn guides now sponsored work is progressing towards getting those cast. The horn guides and the horn stays are, as I have previously spoken about, a part of the suspension of the locomotive and they, in concert with the hornblocks, guide and dictate the motion of the axles in relation to the frames. The frame components are not yet finished though- around the cylinder block (where the frames have had to be bent) there are doubling plates which also require to be machined and formed. 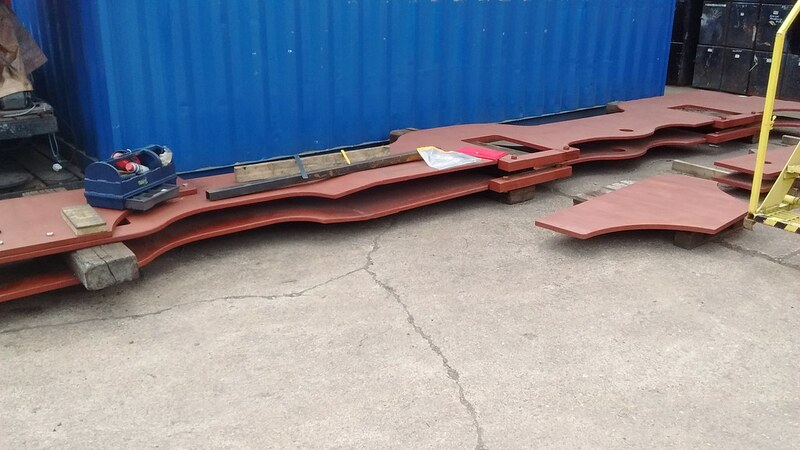 These plates haven't been bent yet and the wish is to have everything with regards to the frames completed before we contemplate bringing them back to Ruddington and commencing erection of the locomotive. Talks are on-going with the Great Central Railway (Nottingham) regarding securing space at the Ruddington site for the storage and erection of the frames and locomotive components. Moving away from the frames and looking at the smaller components, seven of the slidebars are now complete and have been delivered whilst the eighth (which was damaged by the contractors and has had to be replaced) is now awaiting final grinding. Hopefully then we should soon have a full set of slidebars. Work is also progressing on the machinery that is intended to slide in them!- the slidebar slippers are being machined in-house at Ruddington. If we go right back to the very first post in the thread and we look at the photograph of accrued motion material, you will see several long rusty rectangular objects. These are the slidebar slippers. To machine them means to take these rusty castings, remove the rust and also turn them from roughly cast billets to finely machined pieces of material. You have to imagine these lumps of iron rushing back and forth and that as you can easily comprehend would create a lot of friction and heat. Heat causes the metal to swell causes the whole thing to bind up causes our lovely recreated late Victorian express train to, at best, come screeching to a halt. So, how do we avoid this? Lubrication, obviously, and part of that lubrication is whitemetal that forms part of the slidebar slippers. We take the casting, we machine large hollows into it, and we fill those hollows with molten whitemetal. This creates a smooth bearing surface that will slide easily back and forth. We're also looking at the design of other elements of the motion; analysing the valve timings, the valve ports and the eccentrics. Basically we're doing detail design on the steam passages and looking at how we control the movement of steam from the boiler to the cylinder block. It's very similar in concept to a car engine; the whole thing only works if you have compression, fuel, air and a spark in the same place at the same time. In our case we need the steam to be admitted to the cylinders only when the pistons are back 'in'; you rely on the steam to push the pistons 'out' and from there move the locomotive. As you might think this requires a lot of thought and planning to achieve the right valve events in the right order to result in a good engine. Finally, we should shortly have another list of parts for sponsorship; this time the reserved spare parts that form a lot of the motion are up for sponsorship. A lot of progress over the last few months; suddenly it's all starting to look very 'real' and the day really isn't far off when we'll be able to have a walk around and a good look at the engine. The frames are here! The frames are here! Machining of the frames is complete, as was reported back in March, and the horn stays have been manufactured (these kindly donated to the project by the engineering company who machined the frames). A few weeks ago they were delivered to Ruddington Locomotive Works and now the intention is to have them bolted together in time for the annual Supporters Day, which this year will take place in mid-September. There we go, this is one of them from the last Supporters Day back in November 2017. So these go in once the frame plates are upright and in position. After that; the front bufferbeam and the trailing headstock will be fitted. These two components are something of a surprise; I wasn't aware we had them to hand! The bufferbeam is an obvious enough piece of the locomotive, the trailing headstock?- what's that?- think of it as the rear stretcher across the frames. It completes the box-like plan of the frames; also it's the basis of the coupling between the loco and the tender. There's also progress in other areas. The slide bars and slippers are proceeding with their machining, whilst the valve spindle guide and the builder's plates have been ordered from a foundry. As I have mentioned before, there are very few castings in the locomotive and much of it can be and is being built of sheet metal and tube. The valve spindle guide is a casting for which we've had to do all the work- from drawing, to making a master in timber, to sending it to the foundry for casting. We've been rather lucky in that a number of the castings we require we've been able to source pre-manufactured; for example the cylinder block. Between now and September the frames will be bolted together. Eventually the frames will be rivetted; the problem is that rivetting is a hot operation and that of course means that if you were to set out to rivet it up from the outset you'd get all manner of interesting things going on with the metal expanding in the heat. So what we do is to bolt the whole thing together first, and then remove one bolt at a time and replace it with a rivet. Then you skip a bolt, and remove another bolt and replace with a rivet.... and skip the next bolt... and so on and so forth. The idea is that you keep the expansion and whatnot as localised as possible to minimise any risk of bending or distortion. Of course, with an inside cylinder loco, and especially one for which the cylinder block actually sits in a cut-out inside the frames, before they can be set up permanently the cylinder block has to be in place. At the last Supporter's Day we were talking about the necessary machinery being ordered to allow us to undertake the necessary maintenance on the cylinder block required before it can be fitted- bare in mind it's an old casting that was never used and has spent a few decades under a hedge before we found it- so that needs looking at before it can be fitted into the frames and we need to fit it before we can rivet the frames up permanently. A thought strikes me now though. A loco is taken to be in existence when the frames are built. Our frames will be erected by September... so the loco will be in existence by then. A question asked back at the last Supporter's Day was, "who owns the loco? "- to which the answer was, the 567 Group. I'm a member of the 567 Group. Ergo, I'm part owner of a steam locomotive. I can scratch that aspiration off my bucket list now! Congratulations - you're well on the way to becoming a railway baron . There was an extra bit of the last newsletter that I rather kept quiet about, mainly because at the time I wasn't sure if it would come off or not. This is going to be one of those posts that isn't merely a precis of a newsletter. Back in early July I had an email; the June newsletter told us that the frames had been delivered to Ruddington and (the bit I suppressed) that preparations were being made to allow 567 group members ONLY to visit. This email gave us the dates when we would be welcome to visit and view progress. I can tell you this now because today was the last visting day; the next update will be after the AGM in September. I've been to Ruddington today and seen the frames.... do you want to see some photos? Of course you do! A general view of the frames as they were this very morning. To the rear are the side frames, front left is one of the doubling plates (the other doubling plate has already been fitted) and the drawbar and front bufferbeam. A detail of the front end with the doubling plate. The doubling plate actually covers the position where the cylinder block will ultimately fit; on the original locomotives the cylinder block was slightly wider than the space between the frames, and was fitted into a rebate milled out of the side frames. There was only 3/8 of an inch of material left in the sideframes, which made this area a natural weakspot on the original locomotives. With our replica, we're using a slightly different cylinder block which is wider still. The only two ways of getting the cylinder block to fit would be to trim down the sides of the block, which as you can imagine would be something of a tedious and long-winded process, or else to go down the rebate in the frames route. In our case, the rebate would need to be the same depth as the frames are thick, so there would be a huge hole.... That's Not Good. Hence the doubling plates which serve to brace up and reinforce what would otherwise be a natural weak spot. If you question why it should need such bracing, bare in mind in normal service back in the day it only took the slightest of rough shunts to buckle the frames and put the loco out of commission. If anything, our 567 will be doing a lot more reverse running than its Victorian forebears ever did- the potential for buckled frames is so much higher so anything that can be done to mitigate the risk is a welcome revision. This is a detail of what ultimately will be the location of one of the driving axles. I've mentioned before how a steam loco is sprung, how the axles are mounted in blocks that have the freedom to move vertically to take up any dips and rises in the levels of the track. I think I am right in saying that there is a lot of work to be done in this area, you have the castings that the axles sit in but then you also have the guides that those blocks ride up and down in. Then I think the frames need localised thickening in these areas too. Now then, people were actually working on the loco today when I visited. The frames need to be drilled and set up. Some drilling and bolting has already taken place; you can see one of the doubler plates is roughly in location. These are the relatively easy parts, because the only way to get it wrong is to drill a hole that goes though one plate but not the other!- also the precise location of bolts and rivets on the doubler plates isn't critical. What is critical, however, is getting the locations of the bolts and rivets for the rest of the frames right; you can imagine how drilling the holes in the wrong locations could easily result in a skewiff locomotive. I was told today that the frames to date have cost around £30,000 to manufacture; it's an expensive thing to replace if you get it wrong! Measure twice and cut once is very much the phrase in use. This is what was being done today; marking up and measuring out for the rivet locations. This was being done by somebody on their hands and knees using a variety of steel rulers and set squares to draw in the locations using a carpenters pencil, then marking that up in permanent marker pen, and once checked over and okayed by our Chief Mechanical Engineer (who's also CME of the preserved line we're based at, and owns a steam loco of his own), was then hit with a die and a hammer so that the drillbit will have something to bite into when it is time to start drilling all of these holes. I would be surpised (albeit very pleasantly) if the frames are indeed erected by the time of the AGM next month, but I must say it has been very nice today to see work actually on-going and progress being made. Do you want to join us? click here. I have a question I'd like to ask those of you kind enough to follow this thread. Would you like to see updates about the Victorian/ Edwardian carriages that are being restored too? I have mentioned them briefly previously and the ultimate intention is to be able to field complete trains (note-plural!) of the period 1880(ish) to 1920(ish)- which is a vision the 567 project grew out of. The people restoring the carriages are holding a 'come and see' sort of event again this year (this year, it's timed to coincide with the 567 group AGM, so I'm rather looking forward to a day spent viewing progress on both loco and stock).